Deductions are few and far between for property losses. 2. What Is Capital Gains Tax on Real Estate? Selling property at a loss can be a painful process. Depending on the state of your financing and the depth of your loss, you could end up owing additional money to the bank, or you could be selling under duress. While you may gain some benefit on the back end from selling an investment property at a loss, there is typically no tax break for selling a personal residence for less than you paid. While many people will tell you that your home is an investment, the IRS disagrees. They consider your home to be a personal use item, like a car or a food processor. As such, they do not allow you to write off any losses that you incur on the sale of your house. When you consider that they would allow you to pocket up to $500,000 of gain if you sold your house for a profit, this provision seems a little less unfair. 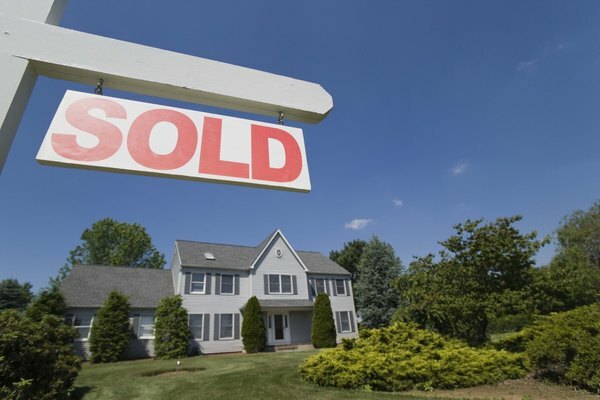 When you sell your home for a loss, you could actually end up owing taxes. Many sales for less than the purchase price also sell for less than the amount owed on the mortgage. When your bank releases you from debt, like in a short sale, the IRS generally considers that release to be taxable income. The tax-code fix passed in 2007 that allows you to avoid paying taxes on mortgage reductions expires at the end of 2013, so you could end up having to pay taxes on a short sale in the future. If you are selling your house at a loss because you need to move for reasons related to work, you can probably deduct your moving expenses. To deduct your moving expenses, your new home will have to be at least 50 miles closer to your new job than your old home was. You will also have to work full-time in the new location for at least 39 of the first 52 weeks after the move. Investment properties work differently. If you experience a capital loss, you can use that loss to offset other gains. For example, if you sell an apartment building at a $250,000 loss, you could sell stock with $250,000 in gains that year and still end up paying no capital gains tax. If you have more loss than you can use to offset gains, you can claim up to $3,000 of the loss against regular income and save any unused loss for use in future years. When you sell an investment property, your loss might be smaller than you expect because you also have to pay depreciation recapture tax on the depreciation you claimed. For instance, if you bought an apartment building for $1,000,000 and sold it for $750,000, you'd have a $250,000 loss. If you claimed $400,000 in depreciation while you owned it, your actual basis would be $600,000, and you'd actually have a $150,000 profit. That profit is subject to a 25 percent Section 1250 depreciation recapture tax.